We got up at 05:50 this morning. We bolted down some muesli bars as a makeshift breakfast, then headed out to the lodge reception and the courtesy bus pickup opposite. A dozen or so like-minded people were there already, and more arrived all the time. 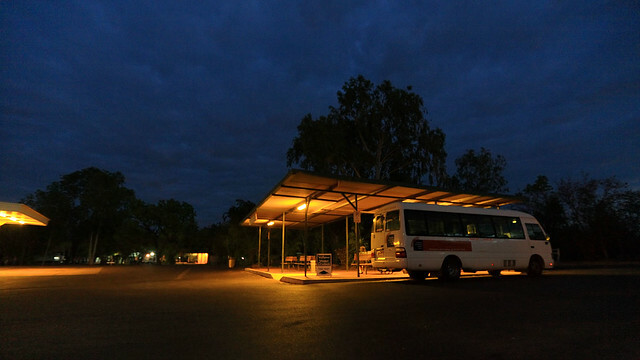 Within minutes, a couple of minibuses pulled up and we piled in for the short drive to Yellow Water - a large pool on Jim Jim Creek where the boats are moored for the Kakadu wetlands cruises. Our cruise began at 06:45 - in time to catch the sunrise - and regarded as the best of the day's options for starting time. Our boat driver and guide was a Gagudju Aboriginal guy named Reuben, who provided informed and entertaining commentary on the sights we would be seeing on and off the water. He began with a short safety lecture: "By law, I have to tell you about the safety procedures. If this boat starts sinking, you'll notice there are life jackets hanging above you. What you do with those is you throw them as hard as you can at the nearest crocodile to distract him, and you jump out the other side of the boat. When you're in the water, form a ring. 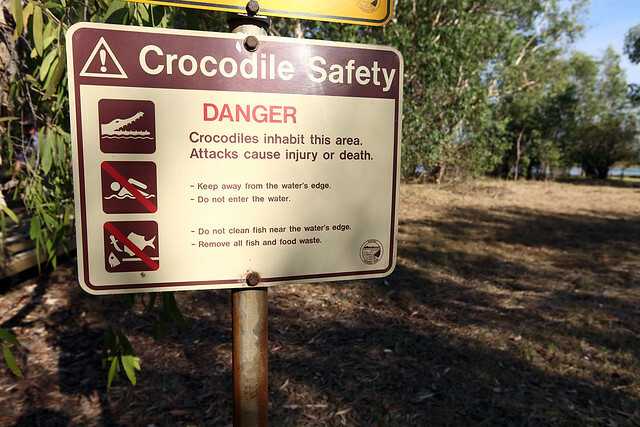 That's so I can jump in the middle and hopefully I'll live a few minutes longer as the crocs work their way through." The cruise was very leisurely, in terms of boat speed, but hectic in terms of sights and activity, as Reuben kept spotting and pointing out the abundant species of bird life which were all around us. We also saw several crocodiles - saltwater ones, in contrast to the harmless freshies of yesterday. These ones are genuinely dangerous and a couple of times Reuben reminded people not to dangle arms over the sides of the boat. The dawn light was stunning on the mirror-smooth water, with purple water lilies lining the margins of the shores, where rows of paperbark trees marked the low-lying land. 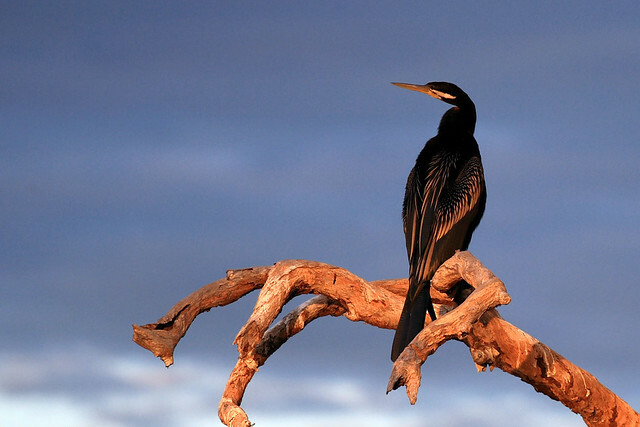 In the branches of the trees we saw numerous birds: cormorants, snake-neck darters, whistling kites, a couple of big sea eagles with bold white chests, as well as smaller birds such as rainbow bee-eaters. Standing in the marsh were egrets, ducks of several varieties (one known as the "thousand dollar duck", because that's the fine if you kill one), royal ibis, stilts, etc. 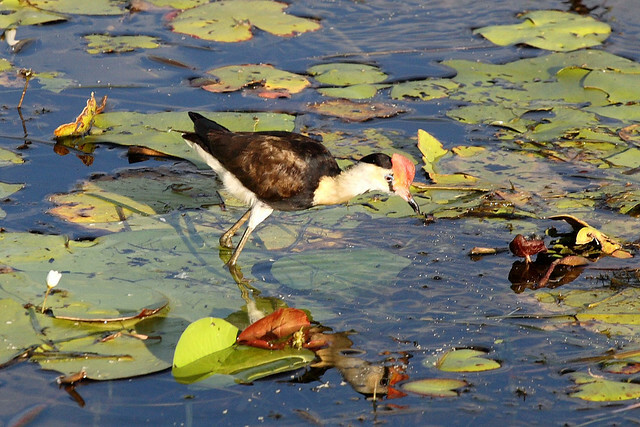 Some of the more interesting birds included jacanas, who walk on splayed feet on top of the water lily pads, brolga cranes, and a pair of enormous jabirus - Australian only stork species. Reuben was calling out bird names left and right, and everyone on the boat was rushing to see. Some of the passengers were clearly keen bird-spotters as they helped him to find a few of the smaller and more hidden species. Reuben said he loved it when "bird mob" people were on board. He also pointed out several active behaviours of the birds, such as a group of ducks getting into a big squabble, some kites being chased by a sea eagle, flocks of birds taking wing because of a crocodile getting too close, a male jacana looking after two babies, cormorants and darters drying their wings, and - very cool - a sea eagle eating something up on a tree branch, ripping it to pieces with its claws and beak. We even saw a goshawk, which had Reuben in fits of ecstasy as he saw it, pondered over what on Earth it could be, then declared, "Wow, I think that's a goshawk! Amazing! I never get tired of coming here, there's something incredible every time you come out on the water." After cruising around a bit on the upstream side of the South Alligator River, from where Jim Jim Creek enters it, we began heading back. 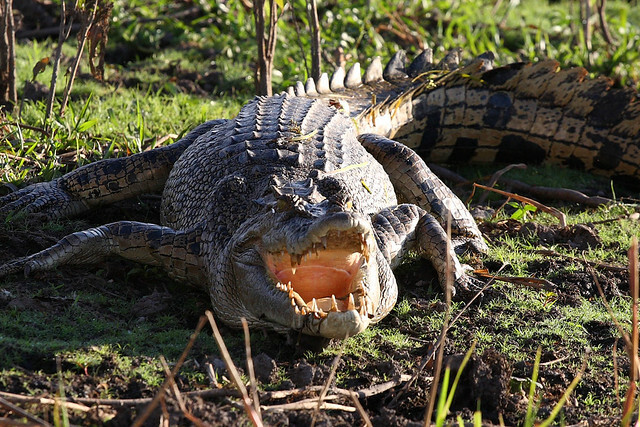 Up to now we'd only spotted female saltwater crocodiles, up to about three metres long. But now we saw that another boat had found the male who controlled the territory we were in - a four-plus metre monster. We got up close, but he sank under the water. Reuben stopped the boat to point out some birds in a nearby tree, and everyone went to look out the left side. Then suddenly the male croc surfaced on the right side of the boat, about a metre from where M. and I were sitting, to the gasps of everyone, who immediately raced over for a close look. On the way back to the wharf, Reuben said that now we'd seen part of Kakadu, but we couldn't claim to have really seen it until we came back in The Wet, when things are very different. He said people complain about the 99% humidity, but that's no reason not to come - he said he hated people who complained about the humidity or used it as an excuse to not come and see the real Kakadu. After a glorious two hours of seeing some of the most amazing scenery and wildlife, we returned to the boat wharf and bus back to Cooinda. It was only 09:00 and we stopped off in the shop to get some milk to have with our Weet Bix for a late breakfast in our room. We relaxed for a while, worn out after yesterday and the early rising today. At about 10:00 we went for a short drive down to the Mardugal camping area, where a couple of short walks were. We did the Billabong Walk, which took us 500 metres to a picnic area overlooking... a billabong. While a pleasant walk through a forested woodland area, the views at the end were less impressive than I'd hoped. I took some photos, being extra careful not to get within crocodile-lunging range of the water, then we returned. We spotted some interesting insect life on the walk. 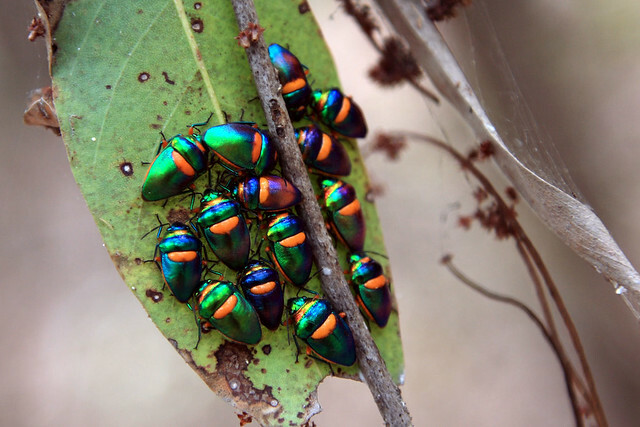 On a couple of trees we saw honey ants with translucent lime green distended abdomens, and on another were a cluster of rainbow-hued iridescent beetles, which I managed to get a photo of. The sun was really burning down from the sky, but the cloud cover was increasing and thankfully covering it up some of the time. The walk back to the car and the getting into its steamy interior really took it out of us. We drove around to find the Gun-Gardun Walk, which was a short loop through the woodland, but we were so hot we decided to give it a miss, particularly as it promised no water views anywhere. We drive back towards Cooinda and stopped in at the Warradjan Cultural Centre on the way. This had a large walk-through display of the local Aboriginal culture, including artefacts, myths, stories, hunting and feeding information, artistic information, social customs, and lots more. They also had demonstrations and teaching sessions outside where people could watch and learn crafts and food preparation skills. Attached was the inevitable gift shop, where we bought a small gift for my mother - an oven mitt with a traditional art design on it. Leaving the centre, we spotted a couple of mistletoe birds feeding in a tree right outside. 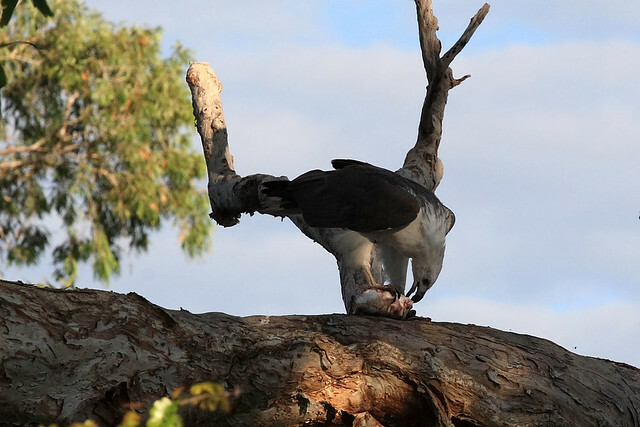 We went back to the lodge at Cooinda and got some lunch. I had a barramundi burger from the bistro, while M. bought some bread rolls to have with the Vegemite we are carrying with us on our travels. This barra burger was far superior to the one I had back in Yulara, with a decent chunk of the fresh fish, grilled, on a substantial burger and salad. After lunch we rested in our room out of the heat of the afternoon. We were both worn out from the last 36 hours of activities and not enough sleep. We emerged at 17:00 to go down to the Yellow Water boat wharf and boardwalk to watch the sunset. It's a short drive to the area, then a walk down to the water, where a handful of other people were out and about, watching the birds or enjoying the relative cool of an overcast evening. We took the boardwalk out to the viewing platform, which commanded a vista north down the length of Yellow Water and a view west through two stands of paperbarks to where a few limpid rays betrayed the presence of the sun behind the thick cloud. We saw some egrets and a black male darter along the way, as well as some whistling kites flying around and some pygmy geese in the water near the viewing platform, but the view here was not great so we wandered back to the road and moved over to the boat jetty sticking out into the water for people launching their own boats from the adjacent ramp. The view here was a lot better, with a vast panorama directly over the water to a marshy area in the distance to the west, where the sun would be setting, if only we could see it for the cloud. A few other people joined us, wandering in and out and declaring it to be a lousy sunset tonight, giving up and leaving, and so forth. 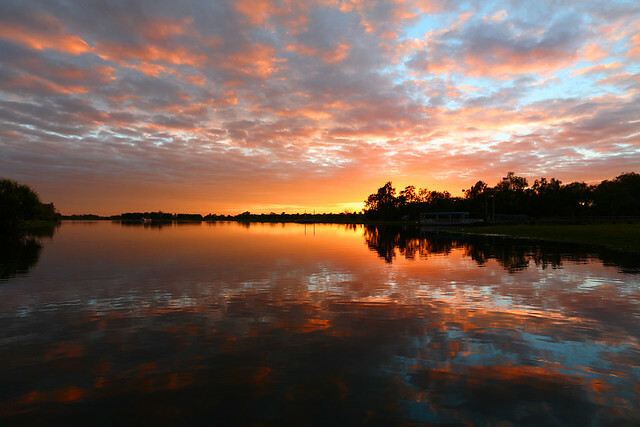 We stayed, since the air was pleasantly warm with a faint breeze rippling the water in front of us. 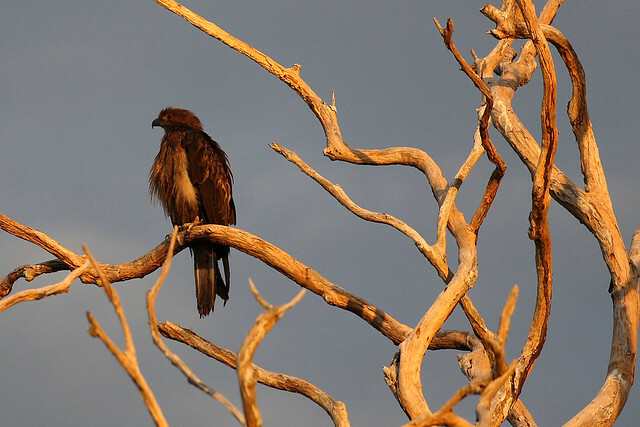 We were rewarded with the sight (at a bit of a distance) of several whistling kites wheeling overhead, a lot of egrets and ducks, some magpie geese, and a royal spoonbill. We also saw a crocodile swimming across the water in front of us, barely visible as a slight protuberance of nostrils from the water which looked basically like a floating stick. It was probably a female. Our patience was also rewarded just before sunset when the sun broke through the layer of overcast right on the horizon, blazing a brilliant burnt orange light across the landscape an silhouetting some skeletal trees in the distance. 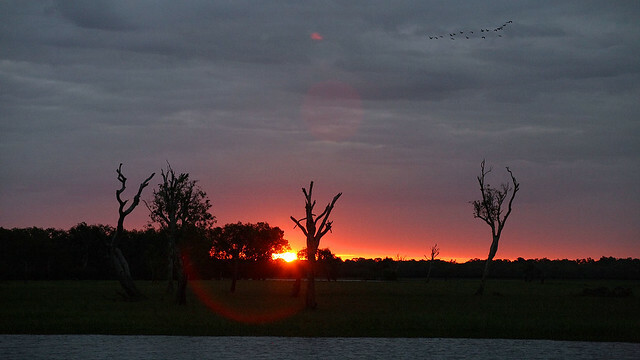 The sun down, it rapidly became grey and dim, and we packed up our cameras and left to return to Cooinda. We'd made dinner reservations last night for 20:00, but we were back about ten minutes before 19:00, so we checked to see if we could move our booking forward an hour. That done, I checked in the shop for a book of bird identifications to help me remember and identify all the photos I took this morning. I found exactly what I was looking for in Malcolm Arnold's Birds of the Top End - a 48-page illustrated colour guide a bit larger than a playing card. To dinner - we skipped the entree and went straight to main course, M. ordering a pumpkin risotto, while I tried my first ever buffalo steak. It came on a bed of beetroot, pumpkin, spinach, and baby onions, which frankly I enjoyed a lot more than the buffalo - which was rather tough and otherwise indistinguishable from plain old beef. We also got a side of lightly steamed vegetables tossed in butter - snow peas, cauliflower, baby corn, asparagus, and carrot - which were delicious. I think my meat-eating is about at capacity over the past few days and I was glad to sink my teeth into some vegetables. And then I needed to try one of the desserts that we'd skipped yesterday. 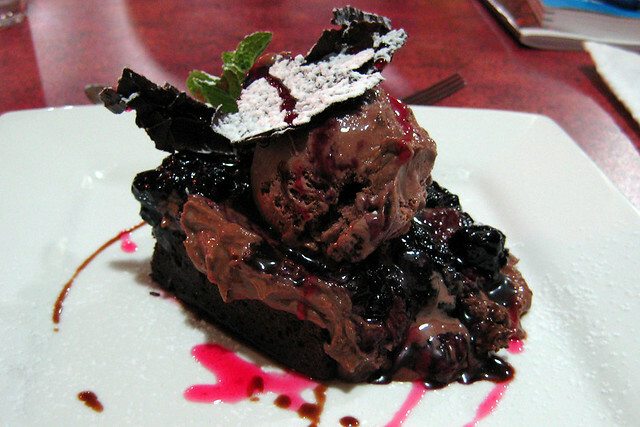 I couldn't go past the "Death by Chocolate" - a clichéd name, but their version deserved it: A slab of heavy chocolate brownie, warmed through, topped with a layer of chocolate mousse, mixed with black cherries, topped by a large scoop of chocolate ice cream, topped by lashings of shaved chocolate, all in a pool of cherry sauce. It was sweet and chocolatey and delicious. Oh, and M. had a coffee while she watched me eat it! Then it was time to retire for the night, review the day's impressive stack of photos, and get a good night's sleep and a well-earned lie-in tomorrow. Last updated: Wednesday, 23 January, 2019; 12:56:59 PST.